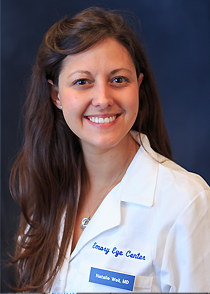 Natalie C. Weil, MD, joined the Emory Eye Center on September 15, 2015, as an assistant professor in the Pediatric Ophthalmology service. Dr. Weil completed her medical degree at Tulane School of Medicine (New Orleans), an internship in internal medicine at St. Luke’s Roosevelt Hospital (New York), following by her residency at Tulane University. She completed a fellowship in pediatric ophthalmology at Emory Eye Center in 2015. Dr. Weil will have a primary practice at Emory University Hospital main campus, as well as secondary clinics as St. Joseph’s. Her clinical emphasis will cover a variety of pediatric ophthalmologic issues and adult strabismus. She is pleased to accept referrals through the Emory Eye Center. For more information, please call 404-778-2020.